Learn about the rashes our treatments cure. Details of our skin treatment products. Application procedures for best results. We only use carefully selected ingredients chosen for safety and effectiveness. We have had grateful letters from thousands of patients over the years. Here is a selection..
All our skin care formulas have been developed over the years by working with clients who have had skin rashes that "nothing would fix". We are so confident in their effectiveness that we offer an unconditional 100% Money-Back Guarantee. 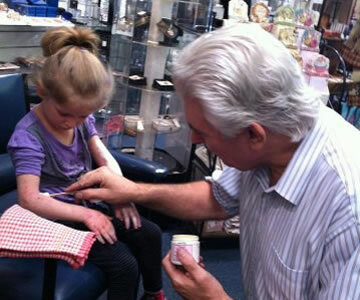 David Hosking is a professionally trained Pharmacist with 30 years of experience in diagnosing and providing successful treatments for a wide variety of skin conditions. He also runs his own nationally-accredited compounding pharmacy in Australia. When David's daughters were born he also experienced what many of his Pharmacy customers had been telling him - that the generally available creams were simply not effective against more severe nappy rash (diaper rash). In an exercise in self-help, David initially developed a nappy rash cream just to cater for the childhood rashes that his own children experienced while they were toddlers. With the success of this nappy rash cure, David has gone on to develop a professionally-formulated range of dermatological products to assist many of his regular clients.